Isla Cuale seems to be one of the best kept secrets in Puerto Vallarta, and yet it is located so conveniently, so mysteriously, in the very heart of the downtown area. A green haven surrounded by the Cuale river, Isla Cuale can be reached by crossing over the North or South bridges in a vehicle. 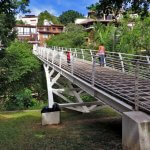 Isla Cuale has two hanging bridges which are of great interest and delight to the children of Puerto Vallarta, and there is even a cultural center at the most inland point. Here you can find various classes from sculpture and painting, to singing and piano. There’s always someone here to chat with, and even a few restaurants where you can stop and get a bit to eat. This small islet was considered a play area for the children of Puerto Vallarta for almost half a century! Of all the things you might expect to find on Isla Cuale, we’re pretty sure that a bronze statue of John Houston is last thing you would have said. Nonetheless this is just what you will find in front of the old Le Bistro restaurant (which closed its doors last year). This monument was erected to mark the 25th anniversary of “the Night of the Iguana” (which really put Puerto Vallarta and Mismaloya Beach on the map). Where the Isla Rio Cuale meets the Pacific you can watch the children play, pelicans bask in the sunshine, and visit the archaeological Cuale museum. During the rainy season you will see the river is high and runs heavy into the ocean where, at other times of year, it is usually calm and low. In the middle section of Isla Rio Cuale you will see there are vendors selling some great items, handicrafts, and trinkets. While you’re here why not buy a paleta (popsicle) from a walking vendor and relax in the sunshine on one of the many white benches across Isla Rio Cuale?